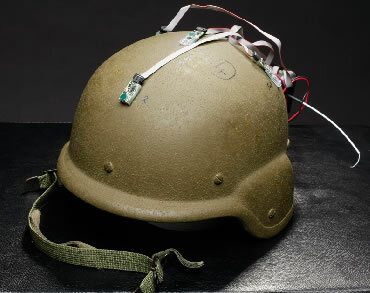 A network consisting of helmet-based smart nodes can provide a platoon of soldiers with a 3D map of enemy shooters. Wireless links between helmets coordinate acoustic gunshot signature information collected by helmet microphones. When a high-powered rifle is fired, it produces two different kinds of sound waves. One is the “muzzle blast” that expands outward in a spherical wave from the muzzle. The second is a conical shock wave that is produced by the bullet as it travels at supersonic speeds. Each node of the shooter location system contains an array of four sensitive microphones. If at least three of the microphones in a single node detect the muzzle blast, the information allows the nodes’ microprocessor to calculate the direction that the sound came from. If the same array also detects the arrival time and angle of the bullet shockwave, a simple calculation gives the shooter’s location. The system can even identify the window from which a sniper is firing, even if the sniper is well inside the building at the time. In his excellent 2007 book Quantico, Greg Bear writes about a weapon sound tracker. Use the link below to read Bear's comments about his idea. Sound trackers on the roof could zero in on weapons action and coordinate return fire through UAVs and their only other air support, the Superhawk. A final advantage to the real-life helmet-based sniper location system is the cost. Other shooter location systems cost from $10K to $50K per unit and are quite bulky. The new system weighs just a bit more than the 4 AA batteries that power it and can be made for about $1K. From Vanderbilt University via Next Big Future.